Palm Coast, Fla. – Hammock Beach Resort, a AAA Four Diamond-rated beachfront resort in Palm Coast, has been named a top 10 resort in Florida by the readers of Condé Nast Traveler. 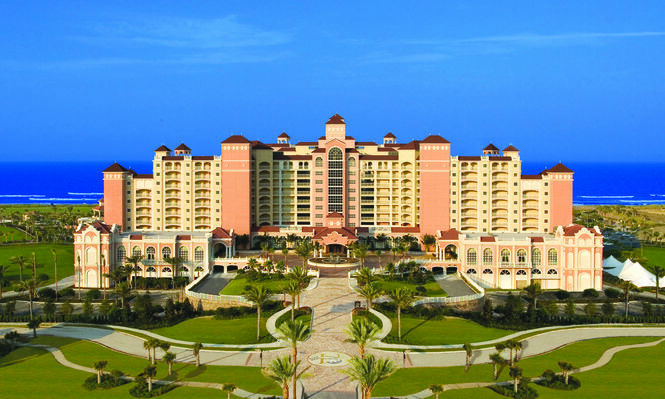 Condé Nast’s Readers’ Choice Awards ranked the Top 25 resorts in Florida in which Hammock Beach Resort came in at No. 7. This is the resort’s second year in a row securing the No. 7 spot on Condé Nast Traveler’s ‘Top 25 Resorts in Florida’ Readers’ Choice Awards list. The luxury family resort features spacious villa accommodations, a full-service spa, tennis facility along the Intracoastal Waterway, multilevel water pavilion, an indoor pool and fine dining. Hammock Beach is also home to two award-winning golf courses: The Ocean Course, a Jack Nicklaus signature design and the Conservatory Course, a Tom Watson signature design. The Ocean Course features six holes that play right along the Atlantic Ocean, more than any other golf course in Florida, while the recently-renovated links-style Conservatory Course is the longest course layout in the Sunshine State. Keep up with Hammock Beach on Twitter at @hammockresort, Facebook at facebook.com/HammockBeachResort and Instagram at @HammockBeach. For additional information about Hammock Beach Resort, call (866) 841-0287 or visit www.hammockbeach.com. Operated by Salamander Hotels & Resorts, the AAA Four Diamond-rated Hammock Beach Resort is conveniently situated along two miles of spectacular Atlantic beach on Florida’s Palm Coast. Hammock Beach features over 300 accommodations, including a 12-story tower of luxury suites and countless other amenities for families and group. Hammock Beach is famed for its two spectacular golf courses: the Ocean Course, designed by Jack Nicklaus, is one of Florida’s highest rated and plays six holes directly along the Atlantic Ocean. The Conservatory Course was designed by Tom Watson and is one of Florida’s longest layouts, characterized by waterfalls, babbling brooks and field stone work. For additional information call 386-246-5500 or visit www.hammockbeach.com.